Hello I am a new user in this forum. 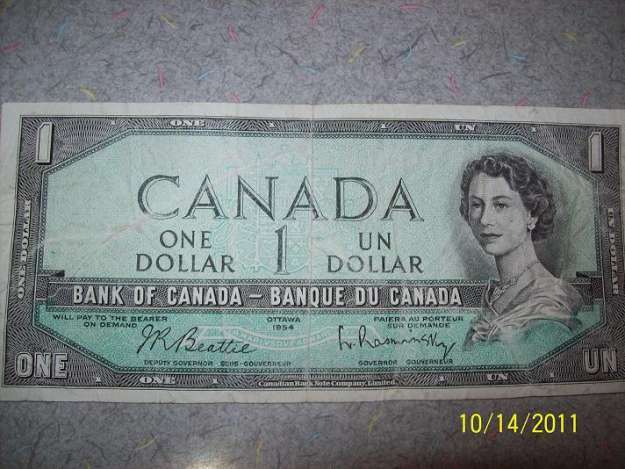 I am a collector in the USA but my family had relatives in Canada when I was growing up. They ran a theater in the early 1900's so had a lot of coins they had collected over the years. These coins came into my family when they passed away many years ago. I am going through them now that my Father has also passed away. 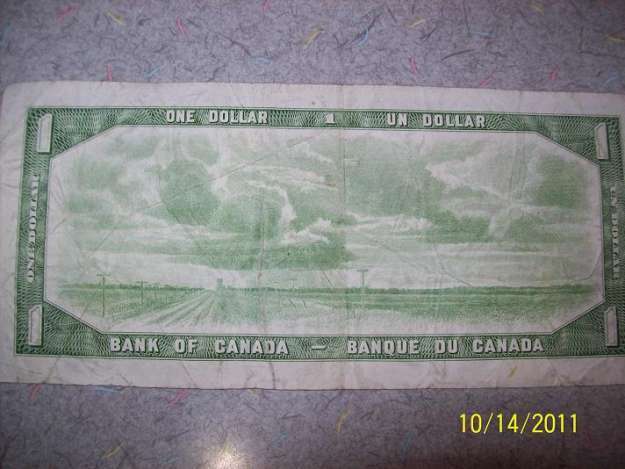 I have a 1954 1 Dollar bill that does not have a serial number on it. It is in good shape but not perfect. First could it be counterfeit? Second I have not been able to find some idea of the value so any help there would be much appreciated. I have included pictures. Thank you for any help anyone can provide. The serial number can be easily erased. This doesn't had any value to your bill. Been very busy but thank you for the reply. No smell and nothing under UV Light where the numbers should be, which was recommended to me by another friend that is a collector. Any other way to check the bill to see if it had numbers printed on it? I say keep the note as a novelty.. as I think it's pretty cool... but the chances of this being a legit error are very slim... and even if that was the case, you will be hard pressed to find someone that will pay full value as most people will be skeptical. I have only 3 hole in the wall coin shops near me and none of them would even look at it. I will wait until the next coin show hits San Francisco and take it there. My dad was a big collector he even has a US VP bill in his collection. For now I will put it next to that. Here's my 'mystery' no serial #, $1 1937; with a light table you can see the RED ink and 'extremely faint' numbering but not enough to decipher. No chemical smell and nothing to suggest scrubbing or erasures. So, it's just a novelty in my collection.